Microsoft asks people to "ditch" their PS3 systems for an Xbox One, and the company will give people $100 for doing so. In an email to customers, Microsoft announced its promotion for trade-ins toward the Xbox One. From Jan. 23 to Mar. 2, customers receive $100 in store credit when trading in select game consoles for an Xbox One. However, the email pushes trade-ins of PS3 systems. 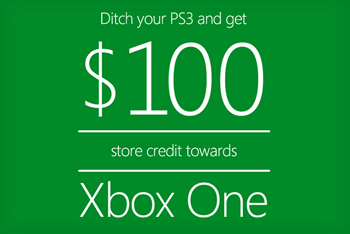 The image in the email reads, "Ditch your PS3 and get $100 store credit towards Xbox One." This store credit would reduce the price gap between the PS4 and the Xbox One. The offer listed on the Microsoft Store website mentions that customers can also receive store credit buy trading in an Xbox 360. Neither the Xbox One nor the PS4 is backward compatible, meaning anyone who wants to continue playing games on those systems need to keep them. Traded-in PS3s must be in working condition, but Microsoft will recycle them. Microsoft and Sony started out the launches of their new consoles with congratulatory remarks toward each other as the companies tried to put an end to melodramatic console wars. Now marketing trumps it all. Promotional materials target Sony's PS3, highlighting trade-ins of the PS3 over trade-ins of the Xbox 360. Both systems still have some life left in them with many games still underway for PS3 and Xbox 360. Tempting PS3 owners to trade in their systems for a new Xbox One may be difficult. Even if they don't end up buying PS4 right away, there are plenty of reasons to hold on to the previous generation of consoles for a bit longer.